This Academic Webinar took place on Wednesday, March 22, 2017 at 12 p.m. EST. 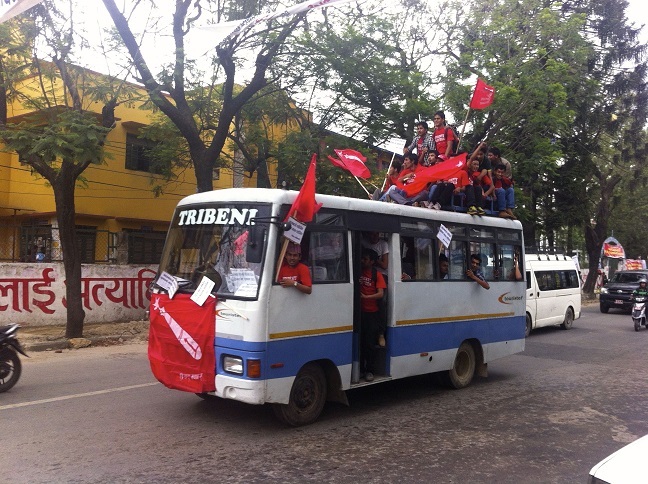 Webinar presenter, Ches Thurber, took this photo of a protest in 2013 in Kathmandu, Nepal. Social divisions, such as ethnicity, race, religion, and class, create unique challenges for those engaging in civil resistance. Researchers point out that civil resistance campaigns in non-democracies are significantly less likely to achieve their goals when ethnic divisions are at stake. In fact, in such polarized environments, civil resistance campaigns are not only less likely to succeed, but they rarely even get off the ground. Constraints on activists’ ability to activate key mechanisms of nonviolent success deter groups form launching a civil resistance campaign and may even encourage them to opt for a violent strategy instead. Examining cases such as the Nepali Maoists’ transition to nonviolent resistance, the anti-Apartheid movement in South Africa and the movement for East Timorese independence, this webinar will highlight tactics such as alliance-building and internationalization of the conflict that have helped movements overcome challenges of organizing in divided society. Key lessons for civic mobilization and civil resistance in polarized societies will be offered and discussed. 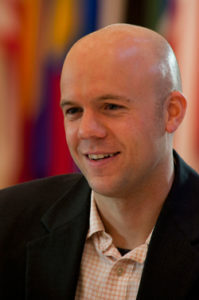 Dr. Ches Thurber is an Assistant Professor in the Department of Political Science at Northern Illinois University. His research examines the range of contentious global politics from nonviolent resistance movements to interstate war. His book manuscript, Between Mao and Gandhi: Strategies of Violence and Nonviolence in Revolutionary Movements, investigates variation in the strategic behavior of groups seeking to capture state power. Findings from his research were featured on the Australian Broadcasting Corporation’s “Big Ideas” radio program. Previous work has been published in Small Wars and Insurgencies, the Journal of Public and International Affairs, and al-Naklah. Previously, Dr. Thurber was a research fellow at the Chicago Project on Security and Terrorism at the University of Chicago and at the Harvard Kennedy School’s Belfer Center for Science and International Affairs. He received his Ph.D. from The Fletcher School of Law and Diplomacy at Tufts University and his B.A. from Middlebury College. Chenoweth, Erica, and Jay Ulfelder. “Can Structural Conditions Explain the Onset of Nonviolent Uprisings?” Journal of Conflict Resolution (2015). Brant, William D. “The Effects of Race and Social Distance on Obedience.” Journal of Social Psychology 112 (Dec. 1980): 229–235. Davenport, Christian, David A Armstrong II, and Sarah A Soule. “Protesting While Black? The Differential Policing of American Activism, 1960 to 1990.” American Sociological Review 76, no. 1 (Feb. 2011): 152–178. Denny, Elaine K, and Barbara F Walter. “Ethnicity and Civil War.” Journal of Peace Research 51, no. 2 (Mar. 2014): 199–212. Ogura, Kyoko. Kathmandu Spring: The People’s Movement of 1990. Lalitpur, Nepal: Himal Books, 2001. Routledge, Paul. “Nineteen Days in April: Urban Protest and Democracy in Nepal,” Urban Studies 47, no. 6 (May 2010): 1279-1299. Svensson, Isak, and Mathilda Lindgren. “Community and consent Unarmed insurrections in non-democracies.” European Journal of International Relations 17, no. 1 (Mar. 2011): 97–120.